Beautiful Bracelets, Classic Fine Jewelry Bracelets. Diamond, Pearl, Gold, Bangles, and Colored Gemstone Bracelets. Stunning Bracelets Embellished with Diamonds, Jewels and Pearls, Crafted of Gold and Colored Gems that Wrap Your Wrist in Luxury. If you love the feel of a quality bracelet warming your wrist and the sparkle and gleam of gold and precious gems in a designer bracelet, this is the place to find that gorgeous bracelet to add to your jewelry wardrobe. We have “bangle bracelets”, “colored stone bracelets”, “diamond bracelets”, “fashion bracelets”, “pearl bracelets”. Designer crafted bracelet collections from amazing designers like: Simon G, Zeghani, Hershey, Everlon, Belle Etoile, Hidalgo Enamel Bracelets and more. Our Bracelet Selection Will Inspire and Delight the Most Discriminating Bracelet Jewelry Collector. If you are a lover of color and bold design you are spoilt with the choices within this Luxury Bracelet Jewelry. Designer bracelets bring bright, fun bracelet styles to a whole new level with their stunning enamel bracelet designs. Choose your bracelet in pattern inspirations that come directly from nature, such as floral influenced bracelets or charming animal bracelets! Paw print designed bracelets are a well-recognized design and an adorable choice for any fashionista. Abstract enamel art design bracelets and birthstone colored gemstone bracelets make special gifts. You will love the creations by Simon G, Zeghani, Hershey, Everlon, Belle Etoile, Hidalgo Enamel Bracelets and more. This selection of Designer Bracelets also includes a number of gorgeous colored pearl and colored gem bracelets that express your unique style! Bracelets selections at Kranich's Jewelers are available in delicate, draping chains of gold, heavy, rich, thick gold bangle bracelets. Select a lustrous pearl bracelet that warms the flesh or a glittering diamond tennis bracelet to sparkle and glitter on your wrist or as a gift for that special someone. Thick fashion bracelets, colored gem stone bracelets linked in gold and silver, textured gold bracelets, solid gold bracelets, choose birth stone embellished precious gem bracelets. Two tone gold and diamond bracelets are a popular jewelry wardrobe choice too. If subtle style is more your thing, Kranich's Jewelers offer a number of stunning gold designs. Look through this marvelous variety of delicate bangles with intricate details or elegant gold and silver chain bracelet designs. 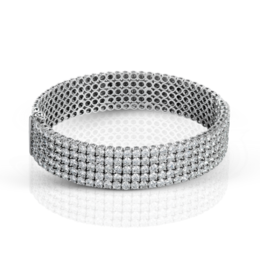 If you are investing in a new Luxury Bracelet you will find that fine jewelry bracelet right here at Kranich's. With such a diverse selection of designer crafted bracelets like: Simon G, Zeghani, Hershey, Everlon, Belle Etoile, and Hidalgo styles there really is a beautiful bracelet designed for you or to present as that special bracelet gift. Kranich's Jewelers Offers Easy Financing for the Purchase of Your Next Gorgeous Bracelet Selection. * Get the Kranich's Card we can finance that diamond ring purchase for you. Financing is Available, We Work with You So You Can Get the Beautiful Bracelet You Want. Get what you want on financial terms that work for your budget. Kranich's Jewelers offers special financing to those who qualify so you can have the special bracelet that you found right here. Just call or chat if you are out of our area or stop in to one of our central Pennsylvania locations in Altoona, Johnstown, and State College. We Help Our Customers Get the Sparkling Bracelets They Really Want.